This dollar store is based in the New York area and wanted to sell its items nationwide. 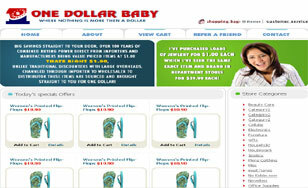 With a New York web design by Bitochon, One Dollar Baby began attracting customers from all over the U.S. Furthermore, these customers returned on a regular basis. This general merchandise Ecommerce website design enables customers to browse different items, make their selections and order with a credit card. The user interface allows the business owner to maintain the site, changing products that need to be added or removed, without the involvement of a programmer.